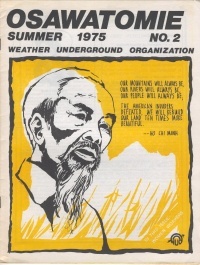 Weather Underground Organization was founded in 1969 as an underground, terrorist faction of Students for a Democratic Society. In 1969, those members of SDS who would later become the Weathermen, helped to set up the Venceremos Brigade (VB), to provide cover for sending operatives to Cuba for training by the Cuban intelligence service, the DGI.. 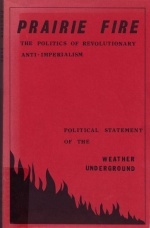 The Weather Underground Organization helped organize and lead the Hard Times Conference with the Prairie Fire Organizing Committee at the University of Illinois Circle Campus in Chicago, from January 30 to February 1, 1976. After the WUO dissolved in 1977-78 and most of its members turned themselves in to state authorities, there remained a leftover grouplet connected to members of the May 19 Communist Organization (an aboveground group linked to the WU which functioned in the New York area between 1978 and 1985) that was critical of any compromise with the state. It was this small group that, in tandem with elements of the Black Liberation Army, carried out the armed Brinks robbery in 1981, during which two police officers were killed. ↑ The Theory and Practice of Communism in 1972 (Venceremos Brigade), Part 2, Hearings, House Internal Security Committee (HISC), Octo. 16, 18 & 19, 1972. Includes the ships passenger manifests for the first five VB contingents, which lists many Communist Party USA members or members of their youth fronts, the W.E.B. DuBois Clubs of America and the Young Workers Liberation League, who will later show up in organized labor, while other names are those of radicals who show up in the WUO, its support arm the Prairie Fire Organizing Committee (PFOC), and other marxist organizations.